Word on the street is that I haven't posted pictures of moose for quite some time. 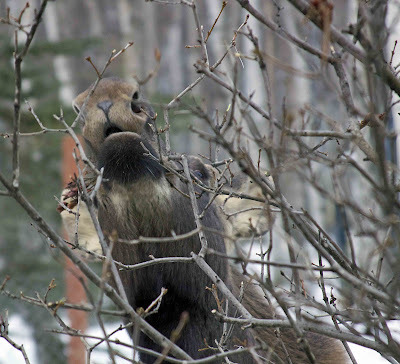 Evidently, the skinny-legged twig eaters have grown offended; I think they've formed some sort of protest group, because I keep running into them at nearly every turn. The other morning, one big mama and her yearling stopped in the middle of the road and made me wait. Honk! Honk! "I've got to get my girls to school! Do you mind moving on?" They continued standing and staring, hoping I'd take their picture, I guess. Honk! Honk! "All I have is my cell phone, suckers!" I yelled at them. "It won't catch you in the dark, so keep on moving! We've got to get to school!" Honk! Honk! We see them everywhere—on walks with our dog, in the parking lot of the video store, lurking in the woods that straggle up to the side of the road. Whenever I've come across them I have refused to snap a photo. That's what I get . . . now they have decided to come to me. This guy basically dared me to take his picture when he spent a half hour on the deck pruning the lilac tree. 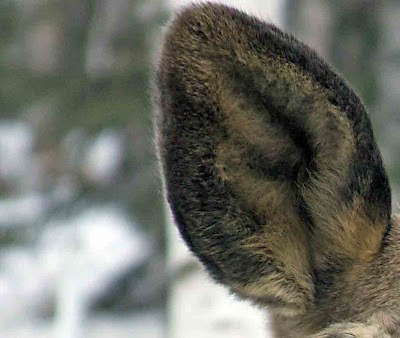 That would be his ear, the better with which to hear Daisy barking wildly . . . There's his chinny chin chin . 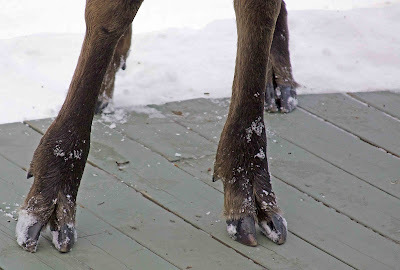 . .
My, what dainty hooves . . .
. . . for a big, dumb moose. 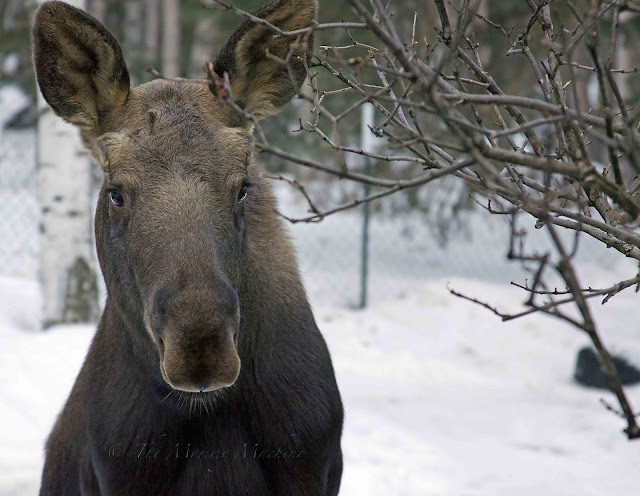 Er, I mean a handsome, intelligent moose. Carry on. Oh he is handsome! Maybe now would be a good time to make some chocolate moose er...I mean mousse. Oh, I loved Alaska! I visited Anchorage about 1 1/2 years ago. That woud be cool, but scary to have a moose on your back porch! I live in suburbia and the only thing we have caught on our back porch was a possum one night. Hello! Visiting from SITS! YIKES that think would scare me! My sister lives in NV and we have run in to little old deer, but nothing that large =) good luck! Well you obviously have a narcisstic moose on your hands. Just keep stroking his ego until he "gets over hisself". Ha. Those are fantastic pictures. What a ham. Can't you twap them with a rubber band gun, or scare them with a firecracker, or something? Air horn? Fire hose? Anything? It looks like he really took offence to the big dumb moose comment. Thanks for brightening my day! I was thinking that there was some definite moose shortage on your blog. I must say, it's about time. He looks offended at that comment. I had a dozen deer in my front yard when I came home yesterday, but they don't look nearly as menacing. I told my family about the last time you had a moose picture and it was eating the pumpkin. My neighbor across the street STILL has pumpkins out. I'm ready to borrow a moose! <3 this! Thank you for sharing. These are some pretty fantastic pictures! Oh, wow! That's crazy to see that in your everyday life! Pretty, though. That's so funny! In Texas, it's deer. At Johnson Space Center, the deer wear collars w GPS. Must go see Homer! Happy SITS day! I love your pictures, and in no way can I relate - the closest thing to a dumb animal scrounging outside my home are the neighborhood cats and they aren't quiet as beautiful. Just stopping by from SITS. Have a great day! LOVE, LOVE your photography and your writing ... I am going to be a follower now. Congrats on your SITS day!! This is probably just because it is a novelty to me...but that's so cool! I bet it gets annoying after the 80th time though. The last shot of the moose is just phenomenal. Looks like I could reach out and touch him! Too funny. They are beautiful and big creatures. Oh wow, this is just an awesome sight. 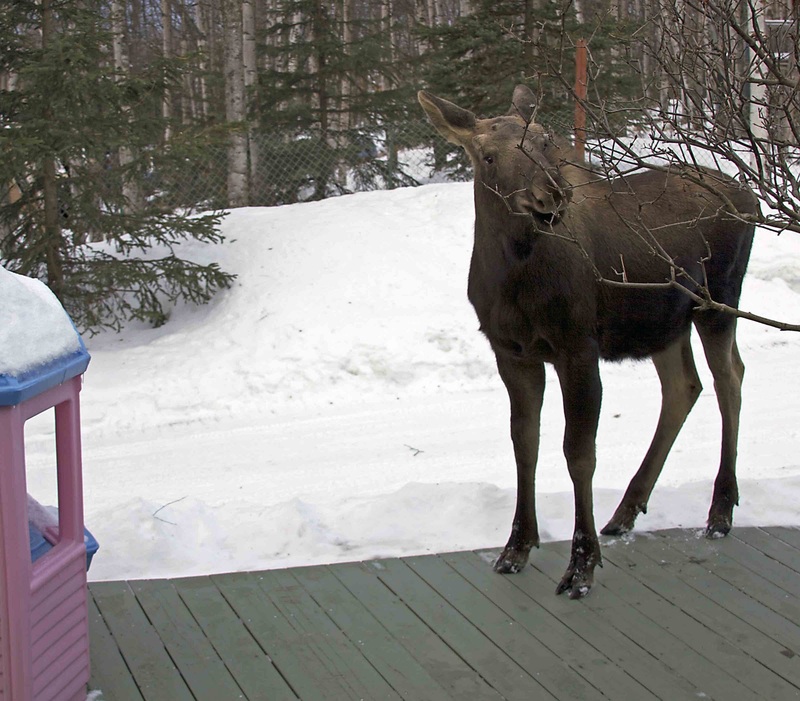 Were you guys ecstatic to see the moose right outside your house? Nabeel, if by "ecstatic," you mean "irritated and annoyed," then YES! VERY! I love his chinny, chin, chin! Too funny!